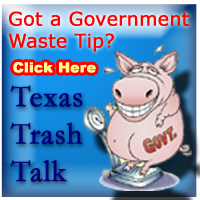 In the Texas Republican Primary Run-Off for Lieutenant Governor, voters have been bombarded with ads and mailers. There are so many candidate attacks…. how does anyone know whom to believe? I wish people would have done that when President Obama first ran for President in 2008. Donor ”friends” such as Bill Ayers, Rahm Emmanuel, George Soros, Valerie Jarrett, and Rev. Jeremiah Wright would have given us insight into the man Barack Obama was BEFORE he was elected. So, it seems very fitting now for Texas to look a little deeper at the “friends” supplying the money for these candidates’ campaigns, to get some insight into who they REALLY are. 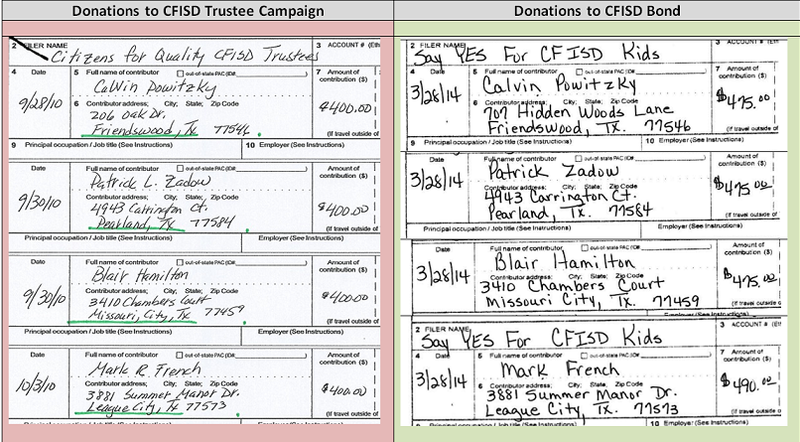 Campaign records show Madeline McClure, Director of TexProtects, donated $6,000 to Dewhurst for this campaign. Not surprising because he appoints her to powerful statewide task forces. She gives Dewhurst credit for passing legislation to use our state tax dollars to fund one of her liberal causes, the Nurse Family Partnership. It is a part of Obama’s government pre-k program and universal health care, and another program designed to substitute government for faith and family. Guess that is why federal records show McClure donated to two federal campaigns in 2012 – Barack Obama and David Dewhurst. McClure is not unique on the Dewhurst list of “friends” who have donated to Democrats on the federal level. Even more telling to me are donors like Julius Glickman. Records show Glickman has supported other liberals on the federal level such as Bill White and Hillary Clinton. Wow…that ended up being a no brainer! Tomorrow from 7:00am to 7:00pm, 23 schools in CFISD will be polling places for voters to decide if CFISD administration will get a blank check for $1.2 BILLION of taxpayer money. Local conservative groups are arguing there is too much “pork” in this bond. They are asking the voters to vote “No” tomorrow so CFISD can come back to the voters in November with the bond broken up into parts. That way the voters can approve the items they consider necessities such as schools and buses, and leave out items they do not want to fund at this time. I haven’t met anyone who has a problem with building needed schools, updating air conditioning systems or buying buses to transport our kids. But the complaints I have heard about “pork” do make sense to me, as a retired teacher and as a taxpayer. Some issues which made me vote “NO" on this bond. 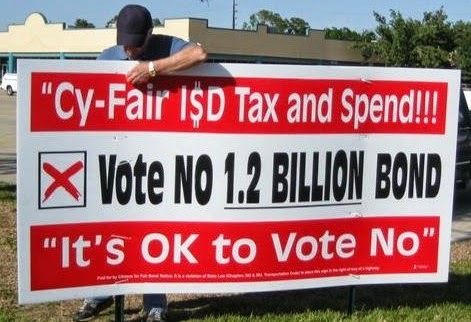 · Blank Check – The voters are approving the bond amount of $1.2 BILLION – not the items to be purchased. CFISD can change their minds and decide to build a new administration building instead of swimming pools, and all the voters can do for recourse is vote out the school board in the next election. I prefer smaller bond amounts every few years so the district is more likely to use the funds as promised. · All or Nothing – I do not see a need for GPS systems on CFISD busses. In 30 years, I never once had a student tardy to school because the bus driver got lost. I also do not see the need to remake the front entrance to CFISD schools with bullet resistant glass. In my experience, the most dangerous location on any campus is the cafeteria, not the front door. And, after being involved in school lockdowns over the years, I know that anything that can keep predators “out” and also be used to keep innocent people “in.” I am much more concerned about my grandchildren being targeted by sick individuals while they are in the fenced school playgrounds than inside their classrooms. I would like to see more security personnel patrolling our schools to protect our students than items that make people just “feel” they are safe. · More indoor swimming complexes that seat 1,500 - I would rather see CFISD invest our money in vocational education, especially the “trades.” Not every CFISD student is college bound. The average salary for an electrician is $ 52,910, a plumber $46,660, and median starting annual salary for HVAC technicians is about $40,000. CFISD needs to invest in more career training before we build more athletic facilities. But even more concerning for me than the bond itself - is the money behind this bond. They must be using some “Common Core” definition of “grassroots” because their PAC is certainly NOT local, spontaneous support. What a coincidence that these donors represent the industries which will profit from the bond. A “NO” vote asks CFISD to come back in November with the bond broken up into parts for voters to choose which sections to support. Early Voting for Emergency Services District 9 is underway. Eleven candidates are running for three positions. The three with the most votes win. There is no run off. With eleven candidates, most of whom have no political history, choosing the top three can be a challenge. Because I write about ESD9 – whose own paid consultant termed “dysfunctional” – many have asked whom I am going to vote for. I am not a brilliant political analyst, nor someone who knows anything about emergency services. I am just a retired teacher turned government watchdog who attends their meetings and files public information requests to research ESD9’s activities. I know some people will say I am nuts. Two of the candidates are people who are not only are unknown in Republican circles, they have never even been politically active. But I don’t believe that my job as a voter is to place politically active people in government positions. I view it more like a headhunter - placing the best people in positions to do a job for the people. So, why did I choose these three? First, because all three understand that they are running for ESD Commissioner, NOT CFVFD Commissioner. Second, because….ESD9 is BROKEN….and I think these three are our best bets to fix it. I will start with Betty Avery because I am her campaign treasurer. I volunteered because I believe the ESD9 board “needs” her skills. Betty likes processes, procedures and details. She is the “Queen of Roberts Rules of Order,” something greatly lacking in ESD9 meetings. I see her using procedure to help keep this board on task. She also has an MBA which can prove extremely valuable in re-structuring ESD9 to make it transparent and accountable to the taxpayers. Betty is very active in the Harris County Republican Party, Chair of the Military Partnership, Precinct Chair, etc. She is dedicated to our community. Betty is willing to put in the time and effort required to be knowledgeable about the issues. She abides by the letter of the law and established policies. I see her as the “informed conscious” of the board, keeping it within its prescribed boundaries. Betty (with a son on active duty in Afghanistan) views our first responders in the same manner she views our military– as persons who deserve our utmost respect. This seems like a given to most of us, but it is also greatly lacking on our current board. Next, I voted for Jeremy Martinson because he is the consummate professional. He is structured, organized, and prepared….other skills desperately lacking on ESD9. Jeremy is not afraid to make carefully considered decisions and does not let popularity interfere with principle. It is rare to find courage, integrity and common sense in someone running for office. Jeremy has proven himself as a firefighter. “their courageous efforts to rescue civilians and firefighters under great stress and extremely adverse conditions." Independent Insurance Agents of Houston named him as their 2009 Firefighter of the Year . one-story wood frame house and to make matters worse, they were told citizens, possibly children, were trapped inside the home. out of the home to waiting EMS crews… Shortly after this save; Engine 27’s crew located a second child and removed them to safety as well. All three victims were viable and transported to Hermann and Texas Children’s Hospital. Due to the training and leadership of these firefighters, three citizens are alive today and where able to meet the firefighters who rescued them several months following this incident." I believe it would be of great benefit to ESD9 to have someone representing our community of whom we can be proud. Someone who understands the risks first responders take and the sacrifices they make every day for our community. Someone who can set financial limits and guidelines while still exhibiting personal respect to our first responders – again, a skill greatly lacking on our current board. My final vote was for Scott Deboer. Scott has the unique ability to empathize with all the constituents of ESD9. As a business owner himself, he appreciates the taxpayer’s perspective. As a member of the CFVFD he understands their risks and sacrifices. As a previous CFVFD Board member, he appreciates the complexity of governing emergency services. As a husband and father, he knows the importance of protecting lives and property. As his homeowners association president, he has experience in tactful leadership and team dynamics. When ESD9 has to deal with conflicts of interest between different groups – firefighters, taxpayers, homeowners associations, etc. - it will be truly valuable to have a commissioner who understands all those perspectives. I know these sound so basic, but they are lacking in ESD9. Because there is no written structure, there is constant conflict between ESD9 commissioners as well as ESD9 and CFVFD. I think Scott is the best suited of all the candidates for this job because of his personality style. He is friendly and flexible, yet he has the courage to back his convictions, having accepted a suspension rather than be silent about department practices he thought were just plain wrong. Then there is the issue in ESD9 of effort - something else often lacking in our current commissioners. For example, ESD9 held a board workshop on Sunday, April 13, 2014. One commissioner and a paid consultant were present at the start of the meeting. A second commissioner came 45 minutes late. Two out of five is - pitiful. Another issue for me is which candidates are really passionate about serving on ESD9? They all “say” they are. But actions always speak louder than words. On April 24, just four days before early voting began, ESD9 Commissioners held their regular monthly meeting. There was nothing earth shattering on the agenda, just routine matters. The two incumbents were present. But only 4 of the 9 remaining candidates cared enough about ESD9 to show up! Where were the other 5? Five people who are asking for our votes? They had something more important to do? I think the people deserve ESD9 commissioners who care enough to at least show up! These four candidates show their passion for the position in their campaigns too. Betty Avery and Tom Bazan were both politically active in the Harris County Republican Party before they decided to run for ESD9. They will both be politically active after this election is over. They know the system and the key players. They have both been not only actively campaigning, but attending ESD9 meetings. They both stepped up to run because they saw the problems in ESD9 and were willing to put forth the effort needed to help fix it. I have been pleasantly surprised by the 110% effort Scott DeBoer and Jeremy Martinson have put into their campaigns even though neither had any political experience or aspirations. They just entered this race to help fix the mess made by our current ESD. They were smart. They admitted they knew nothing about campaigning and asked for help. They studied. They learned about PACs, the laws and requirements. They teamed up early, raised money together, got their families involved, and doubled their money by running as a team. They worked the community, getting signs up, block-walking and speaking to groups. Their campaign had passion and enthusiasm, something so refreshing to see because it is so lacking at ESD9. And these are all skills ESD Commissioners should possess - teamwork, passion, effort and thrifty use of funds. Their campaign proved to me that they have them. So…. why not the other candidates? As I said earlier, voting to me is like being a headhunter - selecting the best people to fill a job needed to be done for the people. Some Republicans have asked how I could not vote for Tom Bazan. He has been one of the most active conservative “community organizers” in the Cypress area. He is a "go getter" and tireless worker. He is in the trenches fighting with us on every cause. He is fearless. He will go anywhere and speak to anyone. As I told Tom, that is exactly why I didn't vote for him. I think Cypress needs him full force. We need him involved in ALL of our battles - organizing, thinking outside the box, speaking out on all issues, even those that might be controversial. If we lose Tom to one issue for years, the conservative community has lost. I think his skills are better served elsewhere – not limited to one fight. Tom disagrees with me. He feels he can do both – be a successful ESD9 Commissioner and still give Cypress conservatives 100% effort. I do have confidence that if Tom is elected to ESD9, he will continue to give other issues all the time and energy he can. I did see David at the drawing held at ESD9 for positions on the ballot. He has spoken at candidate events. He is very articulate and knows much about emergency services. ESD9 is the elected board who sets the tax rate, oversees fiduciary responsibilities, sets standards and plans for the future. CFVFD is a private non-profit corporation. They are a contract provider for emergency services. ESD9 may approve CFVFD’s selection of a fire chief before they approve payment of salary and benefits, but it is not the ESD's responsibility to “place” people they feel are the “most competent” in leadership positions inside a private non-profit corporation. David was reprimanded by the Texas Commission on Law Enforcement OfficerStandards and Education in March of 2012. When asked about the incident at the Cypress Tea Party meeting, he said he erred when reporting his training hours. I respected the fact that he did not make excuses. He took full responsibility for the error. 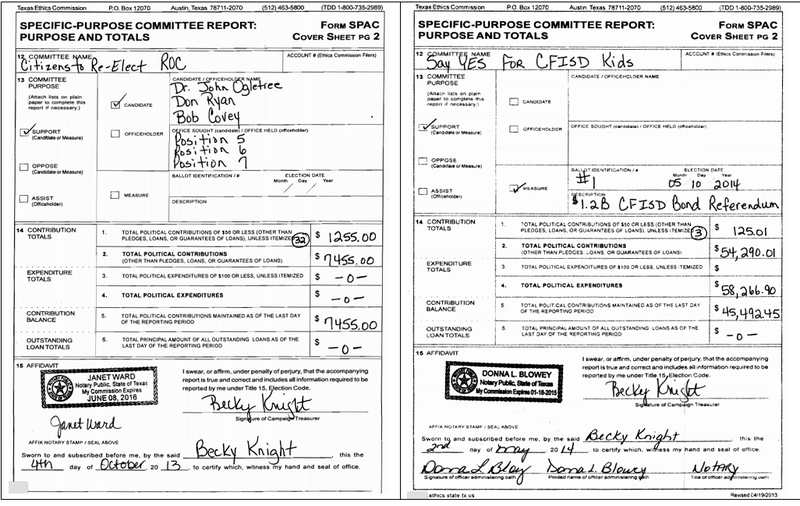 When Robert ran for Constable of Precinct 4 against Ron Hickman in 2012, His campaign finance reports show he received campaign donations from IUOE – International Union of Operating Engineers and HPPU – International Union of Procurement Professionals. How many true “Conservative Republicans” can make that claim? Most interesting is the fact that he and two other ESD9 candidates, James Blackledge and Patrick J Kiley, had their applications for ESD9 Commissioner notarized by Robert Berleth. When speaking at a Cypress Tea Party meeting, the current ESD9 President, Mike Larrivee, explained that Berleth had once worked for CFVFD but had been terminated. He later attempted to bring a union into CFVFD. Berleth filed a complaint against CFVFD with the National Labor Relations Board. I say - if it walks like a union, and quacks like a union, it most likely is a “real” union. 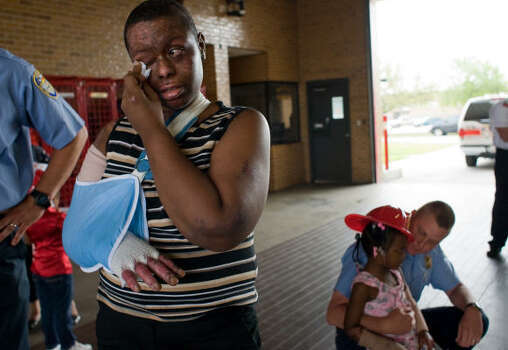 And, the last thing the people of Cy-Fair need is the union in our volunteer fire department. So all three of these candidates are off my list. Additionally, in March of 2013, Ch 2 News reported that Robert Lozano was removed from duty with pay for complaints concerning "improper conduct." I do not know the outcome of the investigation. I was told by a board member that Willa attended one ESD9 meeting. She was not present at the ESD9 workshop on April 13, 2014 or the ESD9 meeting on April 24, 2014. I did see her at ESD9 when the drawing was held for places on the ballot. She did not bother to turn in a CCHC candidate questionnaire, so I do not know her position on issues. When she spoke at the Cypress Tea Party, she stumbled finding an answer to the most basic question – why are you running for this position? I have been told she has signs up, but I have not seen any. Kevin Kyle and Mike Larrivee are the two ESD9 incumbents who chose to run for re-election. We already know what we get with these two, such a “dysfunctional” mess that 9 candidates stepped up to run against them. Mike has been in office for 14 years. I believe in term limits so that automatically takes him off my list. But I must admit, it has been helpful having him run because he has provided the public with the information on Berleth, as well as letting the public know that Kevin Kyle was one of the commissioners pushing to de-fund CFVFD last year, just to get his way. That would have left our community without an emergency service provider – something no competent ESD commissioner would ever risk. Personally, I attended those meetings and I think both were at fault. But I do admit Kevin Kyle was worse. Kevin Kyle is beyond words for me. The only positive comments I can make are that he is articulate and wears nice suits. In my observation, Kyle is the “rotten apple” on the current board. He acts just like our federal government. He uses money to force others to do what he has decided is best for them. When I watch him in meetings he reminds me of Nancy Pelosi. He is condescending. He treats others as if he is superior to them and the CFVFD as if they are bad children. He is derogatory in his domineer and invents conflict to make himself appear superior. In my opinion, for the good of our community, he should not be elected to return to this board. If you have read this far, than you most likely are a person who cares enough to vote in this race. Please study the candidates and make the choices you feel will do the best job to rebuild ESD9 into a commission that works with CFVFD to protect our community.